This mod has not yet been approved by Voobly staff. Use at your own risk. Offline/Automatic use (recommended): Start the WololoKingdoms installer as usual and make sure that "Improve tooltip and tech tree descriptions" is selected before running it.. When you use the WololoKingdoms mod (online or offline), it will automatically use the "extended" descriptions - You won't need this mod in that case. That is what I would recommend, as the mod will always be active when playing a WK game, and never if playing regular aoc. The installer also offers this option in spanish, italian and german. If you want to have the option to (de-)activate this mod easily, you can deselect it in the installer options and instead download it from here. Make sure to deactivate it when playing regular aoc games though, or the info will be wrong! 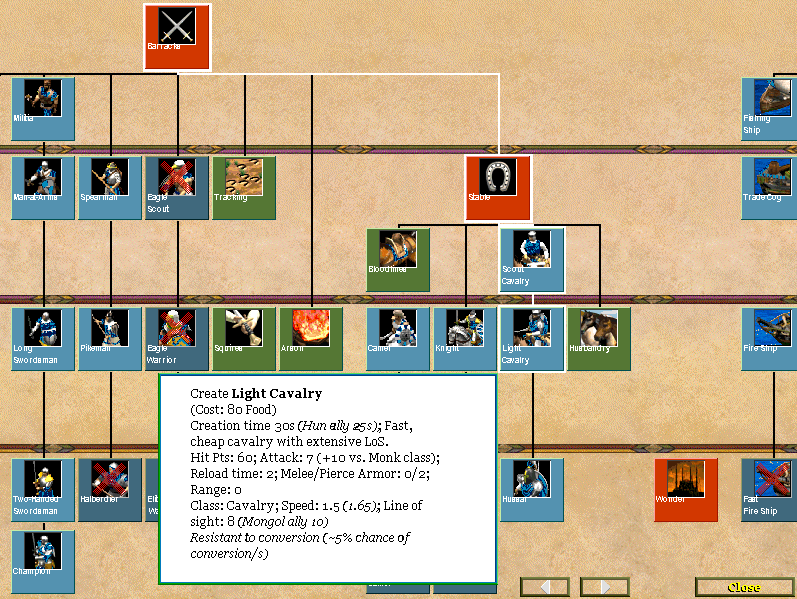 This mod is originally based on Philippe Le Bon's Pro Mod (http://www.voobly.com/gamemods/mod/438/Pro-Mod), with some corrections, format changes and adapted for the WololoKingdoms expansion mod. ([You must login to view link]). The intent is to replace tooltips and tech tree descriptions to fix errors in the descriptions and to add more detail such as attack speed, bonus damage, attack delay etc. More information on attack bonuses, reload speed, walking speed, etc. 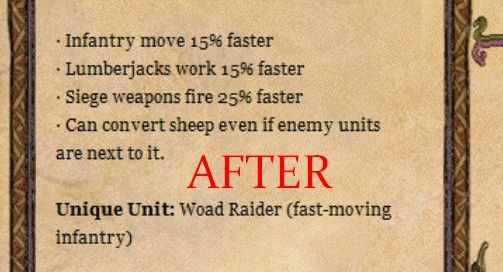 Also works in the tech tree!